I have met Blanche Ravalec twice now. 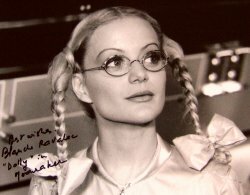 The first time was at Memorabilia in 2005 when she signed my Bond Girls book and also a photograph of herself as the pigtailed Dolly. The second time I met her was at London's Autographica in June 2006. She signed my Jeff Marshall lithograph and then posed with me for a photograph. 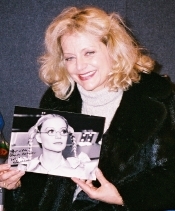 She worked for several years as an air hostess, before making her film debut, in 1978, as Yveline in the successful French comedy L'Hotel de la Plage. French-born Blanche Ravalec first became interested in comedy acting at school, but she was 22 years old before she took theatrical courses to develop her talent. 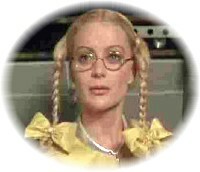 Since Moonraker, Blanche has made more than a dozen films, with many more TV appearances, usually in French comedy. After small roles in three more French films came the James Bond film Moonraker in 1979. In this, Blanche is cast as the tiny strong-girl Dolly who falls for 7'2" strong-man Jaws played by Richard Kiel. Like Jaws, Dolly has no dialogue in the film, so there was little to betray the fact that this was Blanche Ravalec's first English part. Richard Kiel says in an interview, "Jaws is discovered by Dolly in the wreckage of the tram station in Rio and they have about 5 seconds to be attracted to each other and fall in love. Although the lighting on my teeth (causing them to sparkle when I smile back at Dolly) and the Romeo and Juliet music helped to accomplish quite a bit of that effect, it was a little rushed out of necessity as it was a sub-plot and not the major storyline."